Chip Somodevilla/Getty ImagesHouse Minority Leader Nancy Pelosi (D-CA) (C) is joined by (L-R) Rep. Linda Sanchez (D-CA), House Minority Whip Steny Hoyer (D-MD), Rep. Eric Swalwell (D-CA) and Rep. Joe Crowley (D-NY) for a news conference in the House Vistiors Center in the U.S. Capitol March 24, 2017 in Washington, DC. 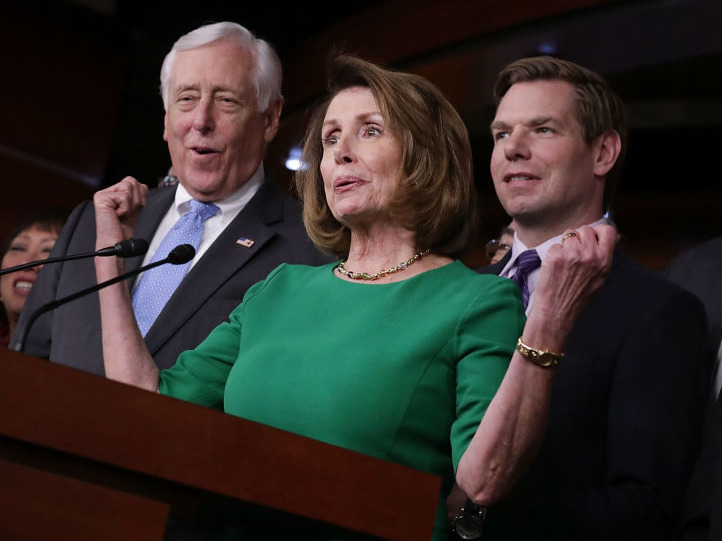 Democrats are reportedly rolling out a new slogan on Monday that is aimed at drawing attention to the party’s economic message. News of the slogan leaked out further on Thursday. Some Democrats have been using the slogan — which is reportedly the result of poll testing and research — for months. Sen. Tim Kaine used it in an op-ed in USA Today in May, and followed it up with a tweet, while other members such as Rep. John Garamendi have also tweeted the slogan recently. Members of Congress often release slogans that fail to catch fire among voters. House Speaker Paul Ryan spent the majority of last year promoting his “Better Way” economic reform plan, despite its contrasts with what then-Republican presidential candidate Donald Trump was promising on the campaign trail.